Tesla Motors has been getting plenty of attention lately because of its heated back-and-forth with New York Times writer John Broder, but that only helped to drown out news concerning founder Elon Musk’s other transport-related venture. NASA announced earlier today that SpaceX’s Dragon capsule would be sent into low Earth orbit for a second supply run to the International Space Station on March 1. Things have been moving at a steady clip for SpaceX after it got over some very public growing pains early on (think a string of failed rocket tests), but a spate of recent successes have helped to change public perception of the starry-eyed venture. When the Dragon capsule (atop a Falcon 9 rocket) takes off from Cape Canaveral early next month, it’ll do so with over one ton of experiments and crew supplies in tow — I’m sure those astronauts will be glad to have something new to do. Granted, NASA’s announcement isn’t terribly groundbreaking — you can look back at the Dragon capsule’s first berthing to the ISS and its first resupply mission for more of a sense of historical achievement — but it paints a very positive portrait of SpaceX and its potential impact on space transport and exploration. 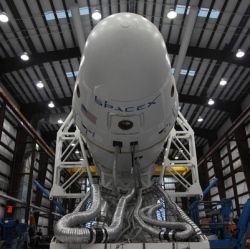 After all, SpaceX’s ambitions aren’t just limited to shuttling cargo back and forth. The company aims to eventually ferry astronauts to and from the ISS, and has pointed to 2015 as a likely launch window for its first manned flight. Other, more seasoned players like Boeing are shooting to get manned flights of their own privately operated crew capsules going in a similar timeframe, but at this stage it seems entirely possible that the upstarts at SpaceX may be able to hit that milestone sooner — it’s planning an in-flight abort test (crucial for any flight involving human lives) for no later than April 2014, while Boeing doesn’t expect its CST-100 to venture into orbit until around 2016. And that’s to say nothing of founder Musk’s wild-eyed vision of sprawling Martian colonies packed to the air scrubbers with settlers from our world.